This bilingual audio CD will jump-start learning for pre-schoolers as they learn: names of animals, directions, polite expressions, places in the community, and counting (cardinal and ordinal numbers) through games such as: 'I Spy', 'Mind Your Manners' and 'Follow the Leader'. Sung by native speakers, these songs are a perfect introduction to the new language (English or Spanish). About Diana I. Shelton (Author) : Diana I. Shelton is a published author of children's books. 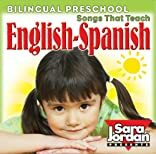 A published credit of Diana I. Shelton is Bilingual Preschool: English-Spanish, Audio CD.